Baby Mama Drama: I'm back! And, SURPRISE! Well, if that wasn't one heck of a blogging break, then I don't know what is! PHEW! Sometimes, you just have let a few things go for a little bit to recoup and get back on track, and that is exactly what I've been doing. What I've actually been doing is puking, sleeping, eating, then puking more and more, add a little more crackers and puke....Why, you ask? That's right. Round 2, y'all! I have so much to update everyone on! And I need to start back with the weekly updates ASAP--I'm already 14 weeks and haven't taken the first bump picture. So, I'm already slacking! We've been busy traveling home for the holidays, a job "situation" (with me, not Adam) and then trying to survive the first trimester. So, please forgive me for my absence. I'm back. I'm hormonal. I'm hungry. And you get to reap the benefits of it all.....YAY! Oh my goodness!! Yay!!!!! Congratulations! Looking forward to updates! Thanks, Courtney! Happy New Year to you! I know it! 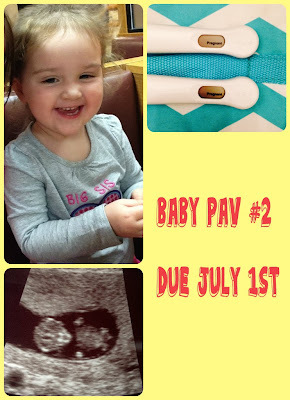 Major baby boom happening this year! Oh goodness, thank you! We can't wait either!